Osteoporosis is a disease that thins and weakens bones to the point where they break easily especially bones in the hip, backbone (spine), and wrist. Osteoporosis is called the silent disease you may not notice any changes until a bone breaks. But your bones have been losing strength over many years. Bone is living tissue. To keep bones strong, the body is always breaking down old bone and replacing it with new tissue. As people enter their forties and fifties, more bone is broken down than is replaced. A close look at the inside of bone would show something that looks like a honeycomb. When you have osteoporosis, the spaces in this honeycomb grow larger. The outer shell of your bones also gets thinner. All this makes your bones weaker. The risk of osteoporosis grows as you get older. Bone loss may begin slowly in some people when they are in their late thirties. At the time of menopause women may lose bone quickly for several years. Then the loss may continue but more slowly. As men age, they do not have the same kinds of striking hormone changes as women do in mid-life because they do not have a menopause. In men the loss of bone mass occurs more slowly. But, by age 65 or 70 men and women are losing bone at the same rate. What are osteoporosis risk factors and causes? When vitamin D is lacking, the body cannot absorb adequate amounts of calcium from the diet to prevent osteoporosis. Vitamin D deficiency can result from lack of intestinal absorption of the vitamin such as occurs in celiac sprue and primary biliary cirrhosis. Certain medications can cause osteoporosis. These include long-term use of heparin (a blood thinner), antiseizure medications such as phenytoin (Dilantin) and phenobarbital, and long-term use of oral corticosteroids (such as prednisone). Osteoporosis can be present without any symptoms for decades because osteoporosis doesn't cause symptoms until bone fractures. Moreover, some osteoporotic fractures may escape detection for years when they do not cause symptoms. Therefore, patients may not be aware of their osteoporosis until they suffer a painful fracture. The symptom associated with osteoporotic fractures usually is pain; the location of the pain depends on the location of the fracture. The symptoms of osteoporosis in men are similar to the symptoms of osteoporosis in women. Fractures of the spine (vertebra) can cause severe "band-like" pain that radiates from the back to the sides of the body. Over the years, repeated spinal fractures can lead to chronic lower back pain as well as loss of height and/or curving of the spine due to collapse of the vertebrae. The collapse gives individuals a hunched-back appearance of the upper back, often called a "dowager hump" because it commonly is seen in elderly women. How Do I Know If I Am Losing Bone? 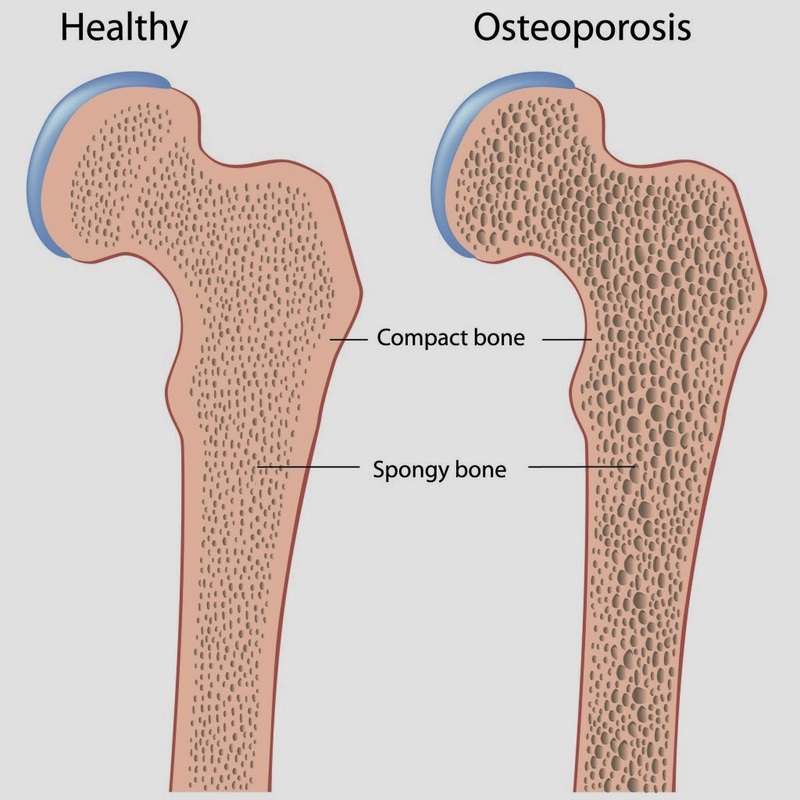 Losing height or having a bone break easily is often the first sign of osteoporosis. But it doesnt need to be. Bone density is a term that describes how solid your bones are. Ordinary x-rays do not show bone loss until a large amount of bone mass is gone. The best way to measure bone density is by a DEXA-scan (dual-energy x-ray absorptiometry). Ask your doctor about this test if you think you are at risk for osteoporosis or if you are a woman around the age of menopause or older. The DEXA-scan tells what your risk for a fracture is. It could show that you have normal bone density. 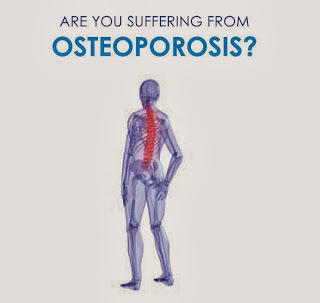 Or, it could show that you have osteopenia or even osteoporosis. The ideal situation is that osteoporosis should be prevented in the first place. If this is not possible, the next best thing is for diagnosis and treatment of osteoporosis as necessary before any symptoms or fracture occur. 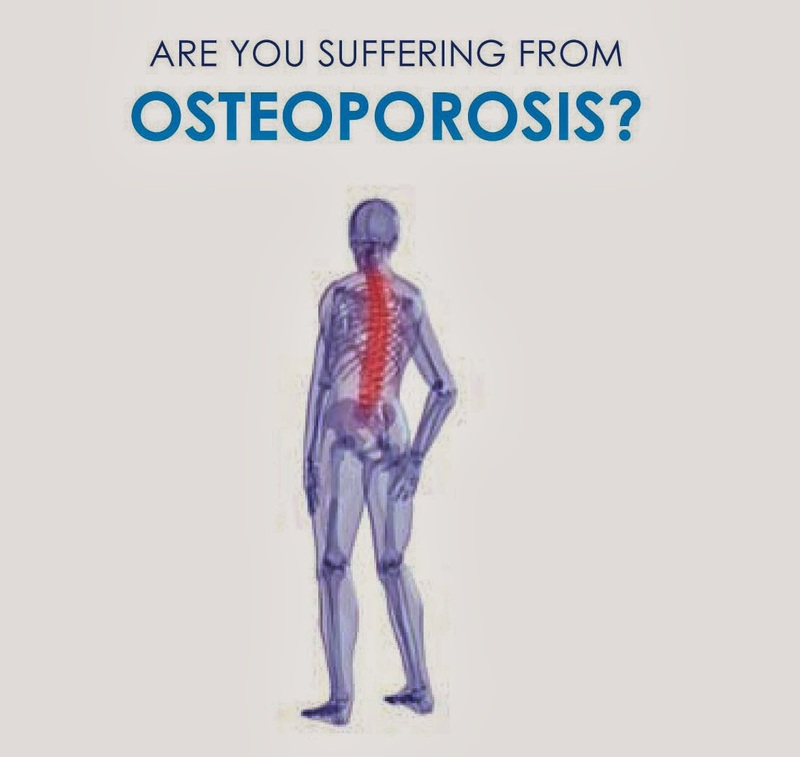 At present, there is no national screening programme in the UK for osteoporosis. However, if you are a man over 50, or a woman over 50 who has gone through your menopause, your GP or other health professional may ask you questions to see how many risk factors for osteoporosis (listed above) apply to you. A risk calculator is available to determine your risk of developing osteoporosis depending on the number of risk factors that you have. If you are found to be at increased risk, or your risk is uncertain, you may be referred for a DEXA scan. DEXA stands for dual-energy X-ray absorptiometry. It is a scan that uses special X-ray machines to check your bone density. A DEXA scan can confirm osteoporosis. Osteoporosis is often first diagnosed when you break a bone after a minor bump or fall. Even after the first fracture has occurred, treatment can help to reduce your risk of further fractures. If you are thought to have sustained a fragility fracture, you will usually be referred for a DEXA scan to look for signs of osteoporosis. However, sometimes women of 75 or older who have a fracture are assumed to have had a fragility fracture. In this group of women, treatment for osteoporosis may be started without having a DEXA scan first. This is because osteoporosis is so common in this age group. A newer test to look for osteoporosis is called digital X-ray radiogrammetry (DXR). It is easier to perform than a DEXA scan because it requires less technical equipment. It may sometimes be used as a screening test for osteoporosis - for example, in someone who has broken their wrist after a fall. However, it is not as sensitive as a DEXA scan at picking up all cases of osteoporosis. So, a DEXA scan remains the gold standard test. These medicines are bisphosphonates, drugs that slow the breakdown of bone and increase bone density. They can lessen your chance of breaks in the spine, hip, and other bones. Side effects may include nausea, heartburn, and stomach pain. A few people have muscle, bone, or joint pain while using these medicines. These drugs must be taken in a certain way when you first get up, before you have eaten, and with a full glass of water. You should not lie down or eat for at least one-half hour after taking the drug. They can cause serious digestive problems. These are available in both once-daily and once-a-week versions. This is a naturally occurring hormone that increases bone mass in the spine and may lessen the pain of fractures already there. It comes in two forms injection or nasal spray. The injection may cause an allergic reaction and has some unpleasant side effects. The only side effect of the nasal spray is a runny nose in some people. Although it is not prescribed often, calcitonin is most useful for women who are 5 years past menopause. This drug is approved to prevent osteoporosis. It is a SERM (selective estrogen recep-tor modulator). It prevents bone loss and spine fractures, but may cause hot flashes or increase the risk of blood clots in some women. Doctors sometimes prescribe estrogen at the time of menopause to slow the rate of bone loss and to increase bone mass in the spine and hip. Estrogen alone, called estrogen replacement therapy (ERT), is used in postmenopausal women who have had the uterus removed (hysterectomy). Postmenopausal women who still have a uterus and choose to take estrogen also receive a progestin to protect the lining of the uterus. This is called hormone replacement therapy (HRT). There are risks with long-term use of these hormones. HRT increases the risk of breast cancer, heart disease, stroke, and blood clots, but lowers the risk of hip and other fractures and colorectal cancer. Estrogen increases the risk of uterine cancer in a woman with a uterus who does not take a progestin and also the risk of blood clots. Each woman thinking about ERT or HRT should discuss benefits, risks, side effects, and other possible treatments with her doctor. 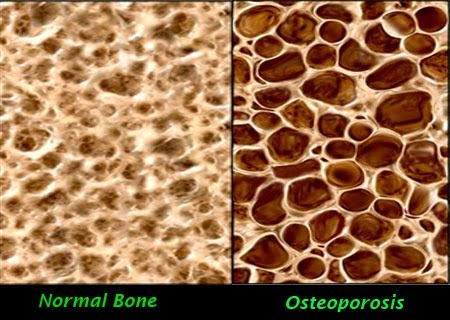 Can I Prevent Osteoporosis, Bone Loss? 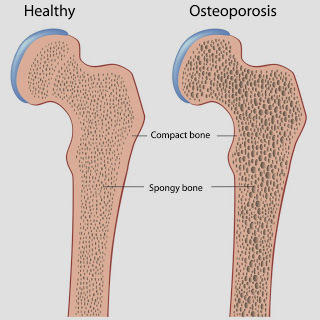 Osteoporosis is preventable. A diet that is rich in calcium and vitamin D and a lifestyle that includes regular weight-bearing exercise are the best ways to prevent weakened bones in later life. Getting enough calcium all through your life helps to build and keep strong bones. Since 1997 the National Academy of Sciences (NAS) has suggested that people over age 50 should get 1200 mg of calcium daily. To do this, make foods that are high in calcium part of your diet. These include low fat dairy foods, canned fish with soft bones such as salmon, dark green leafy vegetables, and calcium-fortified foods like orange juice, breads, and cereals. If you think you need to take a supplement to get enough calcium, check with your doctor first. Calcium carbonate and calcium citrate are two common forms of calcium supplement. Be careful not to get more than 2500 mg of calcium a day very often. More than that amount can increase your chance of developing kidney problems. Your body uses vitamin D to absorb calcium. Being out in the sun for a total of 20 minutes every day helps most peoples bodies make enough vitamin D. You can also get vitamin D from eggs, fatty fish, and cereal and milk fortified with vitamin D. If you think you need to take a supplement, check with your doctor. The NAS says people age 51 to 70 should have 400 IU (international unit) each day. People over 70 should have 600 IU. More than 2000 IU of vitamin D each day may cause harm to your liver and even lower bone mass. Exercise makes bones and muscles stronger and helps prevent bone loss. It is also a way to stay active and mobile. Weight-bearing exercises, done three to four times a week, are best for preventing osteoporosis. Walking, jogging, playing tennis, and dancing are examples of weight-bearing exercises. Strengthening and balance exercises may help you avoid falls and lessen your chance of breaking a bone. Some commonly used medicines can cause loss of bone mass. These include glucocorticoids (a type of steroids) which are used to control diseases such as arthritis and asthma, some antiseizure drugs, certain sleeping pills, some hormones that treat endometriosis, and some cancer drugs. An overactive thyroid gland or using too much thyroid hormone for an underactive thyroid can also be a problem. If you are taking these medicines, talk to your doctor about what can be done to protect your bones. If you smoke, it's important to quit. Studies have shown a direct relationship between cigarette smoking and decreased bone density. Quitting smoking may help limit bone loss due to smoking. If you drink alcohol, do so in moderation (no more than one drink per day for women and two drinks per day for men). Too much alcohol can interfere with the balance of calcium in your body and affect the production of hormones and vitamins that play a role in healthy bones. It can also increase your risk of falling, which could cause you to break a bone. Nutrition and osteoporosis are closely linked. If you're not getting the right nutrients, whether in your diet or through supplements, you're putting yourself at greater risk for osteoporosis. But just what nutrients should you be getting to help fight osteoporosis, and how should you be getting them? The most important nutrients for fighting osteoporosis are calcium and vitamin D. Calcium is a key building block for your bones, while vitamin D is the "key" that unlocks the door to your bones and allows them to absorb calcium. The two go hand in hand: if you don't get enough D, it won't matter how much calcium you get, because your bones can't absorb it properly. But if you don't get enough calcium, there's nothing for the vitamin D to help your bones absorb. To "unlock" that calcium, the National Academy of Sciences recommends 600 international units (IU) of vitamin D per day from age 1 through age 70 and 800 IU after age 70. But some experts are now saying we need even more vitamin D.
Some osteoporosis experts say that we should be getting 800 to 1,200 IU of vitamin D per day. This is particularly important, because the primary source of natural vitamin D -- exposure to sunlight -- carries the potential risk of skin cancer. As more of us slather on sunscreen and stay in the shade, we need to make sure we get enough vitamin D from other sources. When bones are weakened by osteoporosis, a simple fall can cause a fracture or break. This can result in a trip to the hospital, surgery, and possibly a long-lasting disabling condition in the case of a hip fracture. Osteoporosis is the cause of 1.5 million fractures each year. Make sure all the rugs and carpeting in your house are firmly attached to the floor, or remove them. What About Osteoporosis in Men? 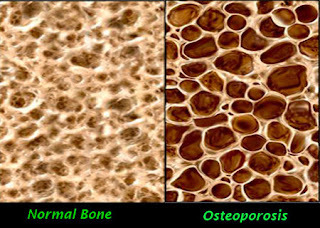 Osteoporosis is not just a womans disease. Men have it also, although not as often as women do. This may be because most men start with more bone mass than women and lose it more slowly as they age. The disease has not been as well studied in men as in women. Most prevention and treatment recommendations are based on studies in women. However, many of the risk factors for men are the same as those for women smoking, not enough calcium or vitamin D, too much alcohol, family history, too little exercise, and taking certain drugs. Low levels of testosterone in older men may increase their loss of bone and chance of hip fracture. Older men who fracture a bone easily or have risk factors for osteoporosis should get a DEXA-scan. If the scan shows osteoporosis, a man should talk with his doctor about which treatment is best for him. Choices are much like those suggested for older women except for estrogen and raloxifene. These drugs have not been well studied in men and are not presently prescribed for osteoporosis prevention or treatment in men. Testosterone supplements may help some men with low levels of testosterone.